This video -- a follow-up to a previous post about strange cloud formations seen over the Sea of Okhotsk last summer -- provides a rare close-up bird's-eye view of cloud streets, which are created when convection currents cut low-lying cumulus into long, clean strips. 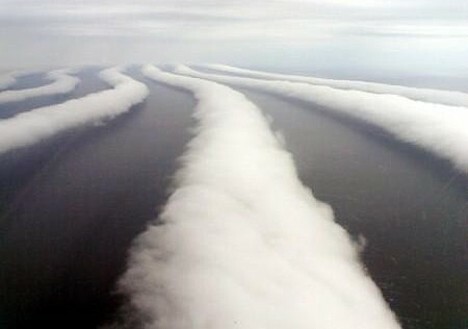 According to the video narration, these clouds floated just over the sea surface, stood 300 meters tall and stretched for over 100 kilometers. ooh, this strange thing !